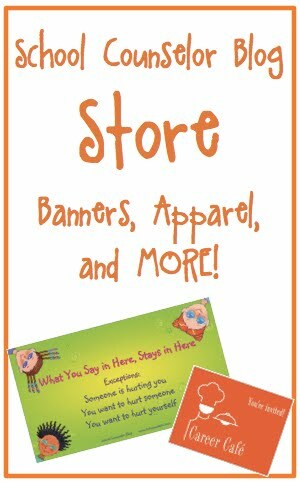 Would you like to win great resources for your school counseling office? School Counselor Blog is hosting a back to school contest with a different giveaway each day from September 1st to September 10th! A different giveaway will be posted each day from September 1st - September 10th! 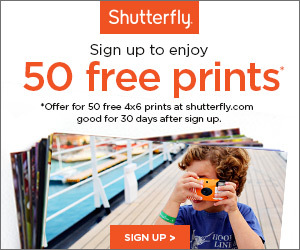 Check back each day for a chance to enter! One lucky winner (U.S. only) will be chosen at random daily. The contest for each item will be closed at midnight and a winner will be announced on the item's contest page the following day. Add a relevant comment to the specific item's contest page about how you would use the item in your work with students. The comment must appear on the contest page for the item (not this post or Facebook). I have made it common practice to move absolutely everything out of my school counseling office each year. I hope that at the end of this year I won't feel the need to do the same. It is a lot of work to move everything out of my office and then move everything back in at the beginning of each new year. Looking on the bright side, I enjoy setting up my space and taking time to make my room student friendly and engaging. This will be my second year in this office and I am excited to think of new ideas of how to decorate it. Here are the before views of my office. I am working on setting things up this week. I can't wait to share new pictures once I finish decorating it for the 2011-2012 school year. Window side of the room. Check out my previous post to see what my school counseling office looked like during the 2010-2011 school year. Do you have questions about setting up your school counseling office? What is your favorite product or resource you use in your school counseling office? 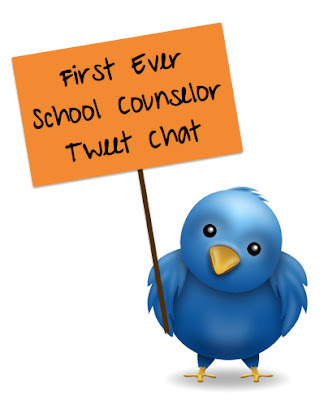 Comment below, tweet, or contact Danielle, share on the School Counselor Blog Facebook Page! My friend, and fellow school counselor, Clare, sent me a picture text the other day from Target of this great $1 spot find! Clare to picked one up for me and brought it to the professional development session we had today. On my way home from the professional development I stopped at Target. I couldn't resist buying a second copy of this puzzle! Part of completed puzzle "Who will you be?" This "Guess What I Do!" puzzle has so many possibilities. I plan to glue one of the puzzles with puzzle glue and possibly use it part of a bulletin board or career display. The second copy I am just going to keep in my office for students to put together. How would you use this "Guess What I Do!" puzzle in your work with students? Comment below, tweet, or contact Danielle, share on the School Counselor Blog Facebook Page! I recently created a Prezi to give you a tour of my 2010-2011 School Counseling Office Space. I have gotten a few requests to see the pictures in an album form, so I created a Picasa album where you can view the pictures. I also posted the pictures below. Please feel free to comment below if you have questions or would like more information about something! Many of the books, resources and products in my office are available in the School Counselor Blog Amazon Store. I made this sign to let students and teachers know where I am. Check out my post about how to make your own! This is where I keep all of my career information and resources for students. This is where I keep my most used resources and lessons. A tie-in I created for a respect lesson in my self esteem group. Books, puppets, games, and toys! My individual counseling area. Lots of books, resources, games, and activities for students to use. They especially love my sand tray! Another view of the individual counseling area of my room. I love my "Kid-Drawn" emotions on the back of the wall. I pushed two U tables together to create one big table for groups. Check out my Amazon Store to purchase these and other great art supplies. View from the door of the back of my room. 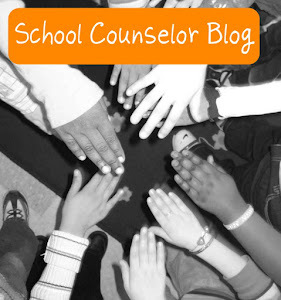 For a more detailed view of the pictures with links and information, view the School Counselor Blog Prezi Tour. Let me know if you have questions about something. Also, feel free to share your favorite resources! 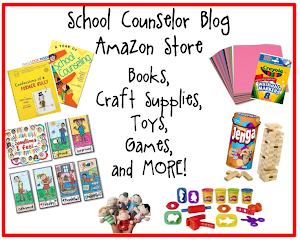 Also check out the School Counselor Blog Amazon Store for products, resources, toys, games, and books in my room!